Latest to be announced in the line-up are designs that demonstrate the huge postive impact of gardens on our health and wellbeing. The 2018 show also champions the immense power of plants, and how plants and green spaces can improve lives and help mitigate against major environmental challenges – including some of the most important issues facing us today. Also new for 2018 are the Space to Grow Gardens. Their focus will mainly be on smaller, urban gardens and they will include ideas on how to make the most of spaces that are typical of a town garden. These designs are also being created to show visitors the benefits that gardens provide, with plenty of great ideas to try at home. The RHS has dedicated an extra 400 sq metres of display space to ensure this new judged category conveys why everyone should grow plants in their garden. Ranelagh Gardens at night is a big change for 2018, with an extension to the opening times on the Friday of the show. To make sure that even more visitors have a chance to see it, the team has announced The Chelsea Late Event, a vibrant evening with bands, an artisan food market and wandering artists, as well as a chance to enjoy the Artisan Gardens by twilight. A carefully selected line-up of some of the best nurseries in the world will be exhibiting in the Great Pavilion, where visitors can enjoy more than 85 nurseries, the best florists in the business and interactive plant science displays in the Discovery area. Peter Beales Roses is celebrating the company’s 50th anniversary, alpine specialists D’Arcy & Everest their 25th anniversary and Hampshire Carnivorous Plants, with their range of Venus fly traps, pitcher plants and other carnivorous species, their 20th year at the show. Main Avenue will welcome 10 Show Gardens. From a romanticised 18th century English tea garden to a timeless recreation of a Mediterranean landscape; a blueprint for city living in contemporary apartments and a garden inspired by the resilience and determination of those living in forced migration, there is truly something to inspire, inform and delight all visitors. The hugely popular Artisan Gardens, combining traditional materials and methods with new design approaches, will be nestled throughout Ranelagh Gardens and include artisan products and high quality detailing. Rustic combines with stylish modern twists, resulting in bold and exciting gardens. Among the larger gardens, many well-known garden designers are returning, each an ambassador for their sponsor. 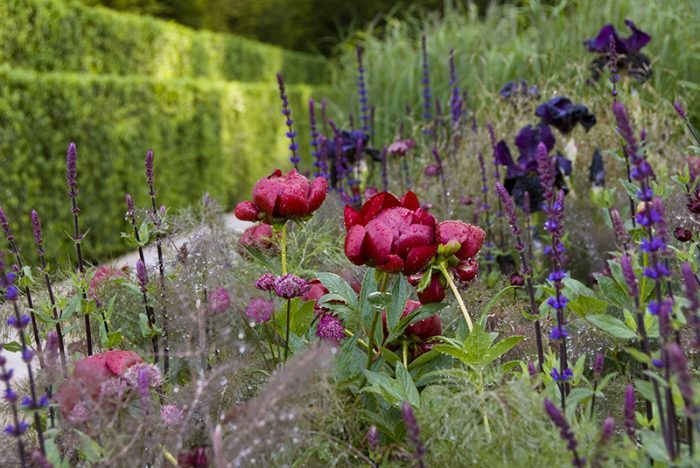 There’s a host of female talent at the show as well – of the 27 gardens, almost half are designed by women. Together, the designers are set to create gardens of the utmost beauty and spectacle, some of which will transport the viewer to locations around the world with their detailed portrayals of landscapes near and far.